Are your cats fighting or showing tension in your household? FELIWAY MultiCat products are a clinically proven, drug-free solution to help alleviate many of the unwanted behaviors cat owners deal with. 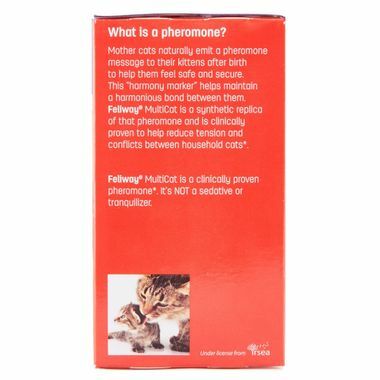 FELIWAY MultiCat sends harmony messages to cats and restores harmony between cats living together. By mimicking the natural feline appeasing messages (pheromones), FELIWAY MultiCat helps your cats live in harmony and avoid tension, conflict and fighting. Cat owners saw a 70% reduction in conflict in 3 weeks. 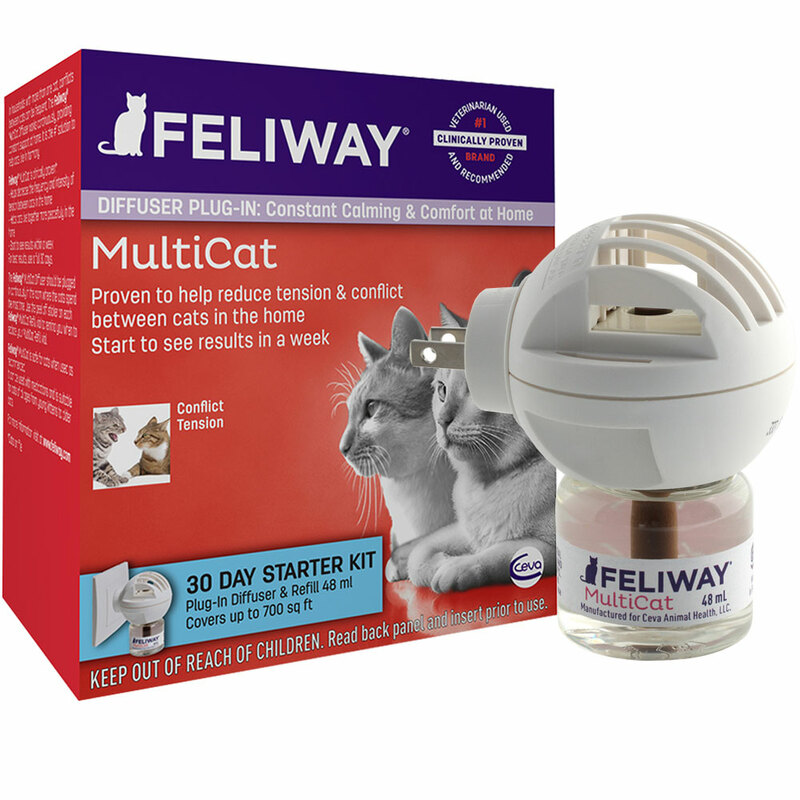 Use FELIWAY MultiCat Starter Kit if you have 2 or more cats living together and if they show signs of tension like chasing, blocking, staring. Use the diffuser in the rooms where your cats spends the most time. 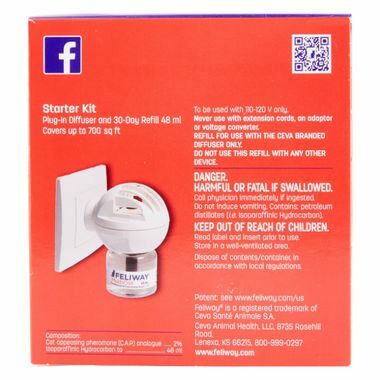 Plug the diffuser in an electric socket with a minimum clear distance above the diffuser of 5 ft. (The oily vapor carrying the FELIWAY messages rises in a column of warm air above the diffuser). One diffuser covers up to 700 sq. ft. You may need to use more than one diffuser for a large or multi-floor home. Be sure to replace your diffuser every 6 months and refill vials every 4 weeks. It is recommended to replace the refill every 4 weeks, even if a small amount of liquid remains in the vial (the vial will never be completely empty). #1 brand used and recommended by veterinarians. Clinically proven to work. Can see results within 7 days. Drug free solution that helps reduce conflict between cats living together. It may help decrease fighting, chasing, blocking and staring. FELIWAY MultiCat Starter Kit includes one diffuser head that lasts up to 6 months and one vial that lasts up to 30 days. FELIWAY® Diffusers should be placed where the cat spends the most time. 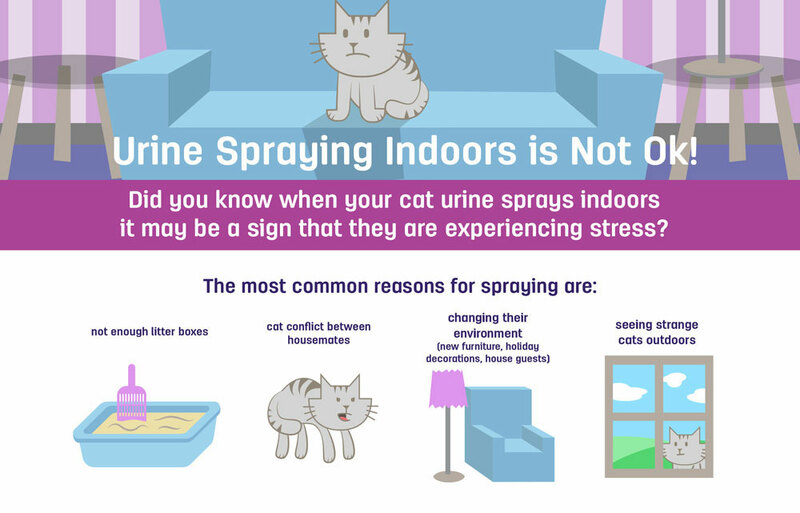 If you are considering this product for a cat peeing outside the box, you can also place the diffuser in the room where the cat is urine spraying most often. FELIWAY® Diffuser should be used for at least 30 days. Most behaviors will show improvement within 7 days, including peeing outside the box and scratching furniture. Depending on the behavior, you may need to continue using the FELIWAY® Diffusers longer than 30 days. When choosing a plug for the FELIWAY® Diffusers, make sure there is nothing above the outlet that will obstruct the airflow and diffusion of the pheromone. It should not be placed under a cabinet, behind a couch, or near an open window. Refills will last up to 30 days but some variations may occur depending on air flow and ambient temperature within the room. One diffuser will cover up to 700 sq ft in an open floor plan. The diffuser will not diffuse pheromone outside of any given room though. Given the size, floor plan, and where your cats spend the most time, you should consider getting more than one diffuser. Diffuser heads should be replaced every 6 months. Newly plugged in diffuser units may have a slight odor for the first 24 hours, but it may last up to 72 hours. Pheromone diffusers are made of self-extinguishing plastic and comply with the International Electro-technical commission (IEC), European (EN) and UL required standards. HAZARDS TO ANIMALS: Keep out of reach of children. 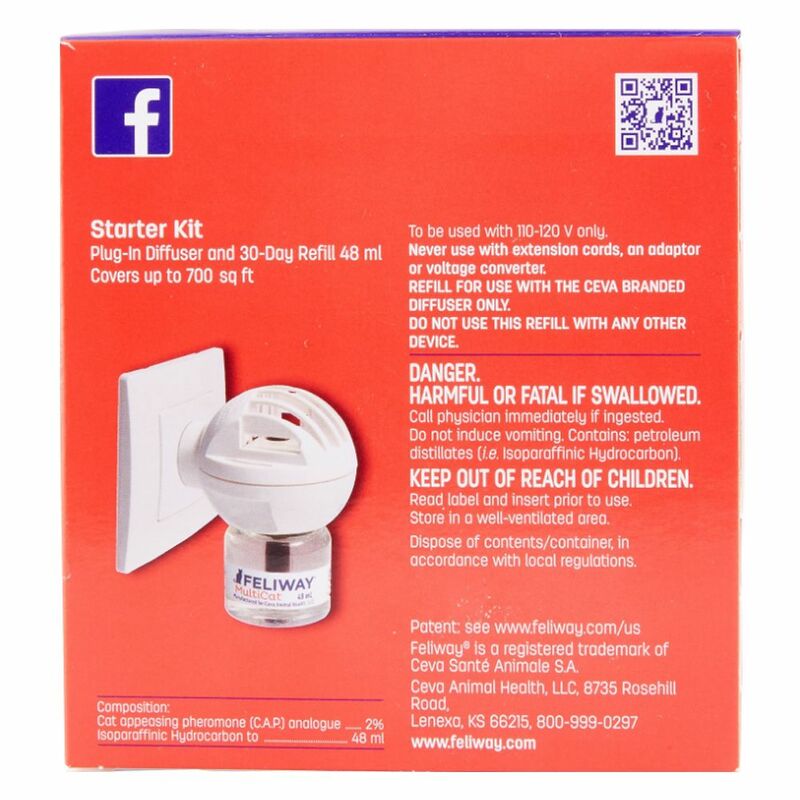 Do the Feliway diffuser refills fit other brands of diffuser systems? No. 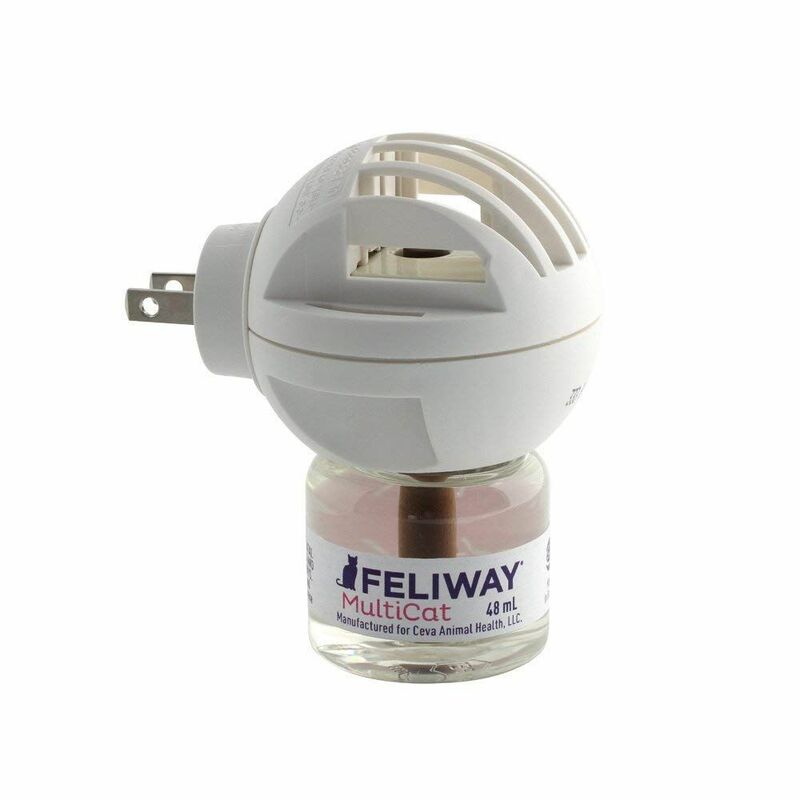 The Feliway refills should never be used with another brand of a diffuser device. The pheromone technology is designed to work at a certain temperature that is specific to Feliway diffusers. What pheromone is in Feliway? 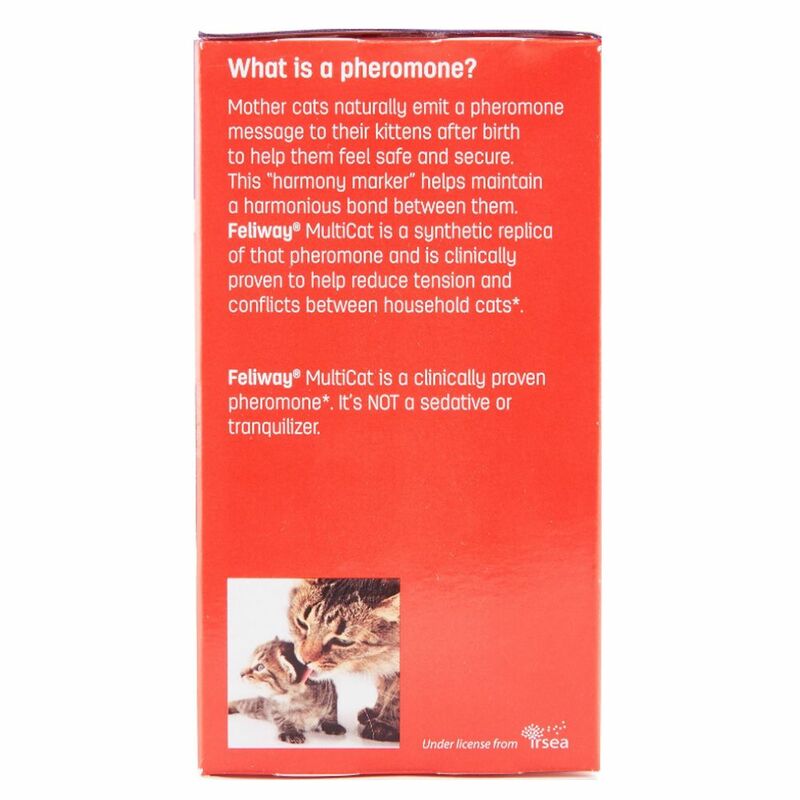 The pheromone released by Feliway is the synthetic copy of the natural comforting pheromone released from the mother cat's mammary area during the nursing period. This appeasing pheromone helps maintain the bond between the kittens and their mother and helps kittens feel safe and secure. The scientific team at Ceva has found that this pheromone can help reduce tension and conflict between cats in the home. Can I use Feliway with a young kitten? Yes. There is no minimum age for using Feliway pheromones. Kittens are able to perceive pheromones in the environment and respond accordingly. How long should I use Feliway? It depends on the nature and the extent of the reason you are using the product. The minimum recommended duration for most situations is 1 month. But some situations may benefit from permanent use. What type of behavior problems may not be helped by Feliway? Feliway has been tested in households where there is tension and conflict between cats. Feliway has not been tested for aggression toward the owner(s). In this situation, consulting your veterinarian or a behaviorist is strongly recommended. 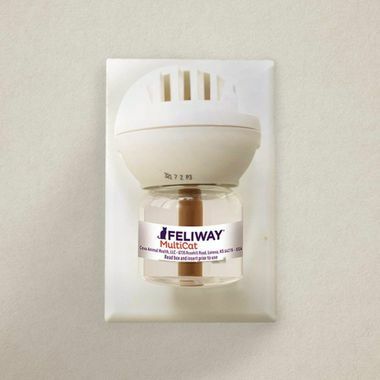 Should I unplug Feliway diffuser at night? No -- the diffuser should be plugged in continuously day and night. Frequent unplugging may prevent the diffuser from working properly. Efficacy was demonstrated in clinical trials with non-interrupted use of the diffuser allowing the cat to constantly perceive the pheromone�s signal. Furthermore, cats are awake and active even at nocturnal times. Can I use the diffuser in a room with air-conditioning? Yes, a diffuser can be used in a house (or a vet clinic) where there is an air-conditioner, provided that it is not plugged in near the air-conditioner, vents, cold air returns, or exhaust fans. Being near additional air-flow may accelerate the diffusion process and the refill vial may not last a full 30 days. How can I tell if my diffuser is turned on or working? When the diffuser is plugged into a working outlet, the diffuser head will be warm to the touch. Can I use the diffuser while leaving the windows open, particularly in the summer? Will that affect the efficacy? Usage with open windows or heavy air flow may result in diffusion at a faster rate. The product may not last the full expected 30 days. In such a case, a different diffuser location should be considered within the house, targeting the area where the cat(s) spends most of its time. We had just moved to a new house and there was a LOT of stress. We have two cats, a boy who is 5 and a girl who is 3. They have been together every day and have always been loving and sweet. We noticed that the boy cat was getting VERY aggressive towards our girl cat. Biting, hitting her, pinning her down and ripping out her hair. It was so sad. We would just hear her scream in the middle of the night and have to go running to break them up. A lot of people recommended these plug ins to us. I was skeptical. It took about a week of being plugged in (which the product clearly states) and it was like our cats were completely different. Both of them were calm, happy, playing together and being so sweet towards each other just like they used to. We haven't had one single fight. Not one single incident that we have needed to break up. SO HAPPY! ProsIt created a happy, calm and peaceful environment for our cats and our family. There is no fragrance that we can detect, only the cats. Works Great - like nothing I have seen before! ConsOccasionally a hassle, like any plug-in when I need to use it, too! Kinda pricey, but what are you gonna do - OTHER than ordering from HealthyPets which even beats Amazon pricing!